What are system and software requirements for NodeXL Pro? 64 bit versions of Windows and Office are recommended (32 bit systems cannot use large amounts of RAM). RAM: More the better! 4GB is enough to handle very small networks, 8GB for medium networks, 16GB or 32GB is recommended for very large networks (100K edges and above). CPU: Most computers are now fast enough to handle network calculations. That said, faster CPUs are good for improving NodeXL’s performance. However, currently NodeXL is a (mostly) single threaded application that does not make use of multiple cores. What is the difference between NodeXL Basic and NodeXL Pro? NodeXL Basic is free and open. It is positioned as a browser for files created with NodeXL Pro which offers advanced features for professional social network and content analysis. For a detailed feature overview to compare NodeXL Basic and NodeXL Pro please follow this link. Can I run NodeXL on a Mac? NodeXL is Windows and Office only. Mac users interested in NodeXL may use a Virtual Machine. We recommend REMOTE virtual machines like those offered by Amazon. While it *is* possible to run a local VM on a MacBook, this is not a performant way to run the application (it can be slow!). Further, a MacBook running Windows plus Office plus NodeXL should have no less than 16GB of RAM. Remote VMs place almost zero resource demands on the client machine (the Mac) and do not require special amounts of RAM or features to perform well. What are the differences between NodeXL Pro Commercial, Academic/Non-Profit and Student user licenses? All NodeXL Pro licenses are for the same application, only the type of user (Student, Academic/Govt/Non-Profit, and Commercial) is different. The pricing structure reflects the ability of our users to pay for a license. Please select the license appropriate to you. On how many machines can I run one license? You may run NodeXL Pro on any number of machines, but only one at a time. The NodeXL Pro License Key file we send to you must be placed on any machine you would like to use to run NodeXL Pro. Place the NodeXL Pro License Key file anywhere on the target machine’s file system. When NodeXL Pro opens, it will ask you to locate this License Key file. This will then authorize the use of NodeXL Pro on that machine. When a machine is authorized for NodeXL Pro all other machines that are running NodeXL Pro are de-authorized. NodeXL Pro will not operate on these machines until one of them is re-authorized. To re-authorize a machine, copy the ORIGINAL license file (the one attached to the license email) to the target machine. DO NOT use the license file from any other machine. When a license file is authorized, the copy of the license file is imprinted with machine specific data that prevents it from running on any other machine. Only the original license file can (re-)authorize a machine. I ordered a NodeXL Pro license key but I did not receive an email with a license key. What should I do? The original license key email is often sent within a minute of the order. If you do not receive a license key email promptly please check your “Spam” or “Junk” folders. You should also check to see the email address that you used to pay for your license key. In some cases the email associated with your payment is different from your main email address. If you cannot find the original license key in your emails, please send a short note to info@smrfoundation.org with the exact email address and the payment transaction ID used when purchasing the license. I lost my license key. What should I do? If you cannot find the original license key in your emails, please send a short note to info@smrfoundation.org with the exact email address you used when purchasing the license. What are the limits of the Twitter data importers? The use of NodeXL Pro Twitter data importers requires a twitter account. Before your first data import you need to authorize NodeXL by entering a token number which is automatically sent to you during the authorization process. Moreover Twitter’s public free API has many limits. NodeXL Basic and Pro are both effected by these limits. Data is available only for 8-9 days. Queries cannot return more than 18,000 tweets.The follower network is further restricted: the rate at which queries about who follows who can be asked is low. NodeXL Pro does not enable the collection of data beyond these limits. That said, NodeXL can process data from commercial data providers (like Crimson Hexagon or Radian6). While these are expensive options, they may be the only way to get historical data from Twitter. Commercial services like Radian6 and Crimson Hexagon provide archival data – but not cheaply! You may be able to get a little bit more data from the public Twitter API by using the SINCE: and UNTIL: operators – example:QUERYTERM since:2016-01-21 until:2016-01-27. Since: and Until: operators scope the time frame of the query. Twitter controls its API and throttles it based on unknowable parameters. We notice that the more the volume of tweets == less tweets delivered. One alternative is to do day long slices and append them in order to maximize the data available from Twitter. You may also be interested in th Connected Action Graph Server Importer which enables NodeXL to connect to the “STREAM” API from Twitter (which sometimes delivers larger volumes of data). What are the limits of the Facebook data importers? The only major limit of the public free Facebook is time. You can get as much historical data from fan pages and groups as you like, yet the network data download may take quite a while as the download stops and resumes. Please note that the download of network data from large fan pages can easily max out your system memory if you do not limit the number of reactions, likes and shares when setting up the data importer. What is a 3rd Party Data Importer? NodeXL Pro allows for 3rd party developers to create data importers that can integrate into the NodeXL Pro > Data > Data Import menu. In that menu you will also find a list of links to 3rd party importers currently available. What are the limits of the Flicker data importer? Flickr limits access to their API on a per key basis. You should stay under 3,600 queries per hour or Flickr may block or terminate your access. How can I Merge Workbooks? Merging workbooks is not a simple operation. 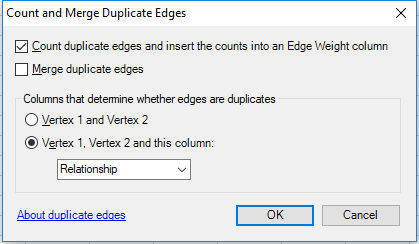 Errors are possible when appending rows to the edges and vertices worksheets. 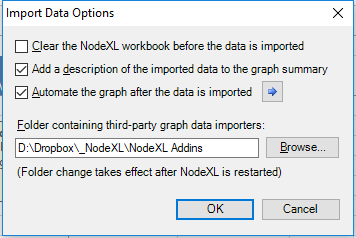 One approach is to turn off an option in NodeXL>Data>Import>Import Options that clears the workbook before importing new data. If you do decide to paste multiple workbooks together please consider the following issues and steps. NodeXL uses “Named Ranges” for all of the tables and worksheets. Pasting new data in the first blank row may not extend the named range for edges, or it may break the existing named range. SOLUTION: Paste INSERT the new rows in the edges the worksheet, starting in a row above the last row. SOLUTION: Be sure to remove duplicate rows before analyzing the new aggregate workbook. You will then need to recalculate all metrics (or just re-run NodeXL>Graph>Automate>Run) to analyze all the new data in your network. Also note: NodeXL networks have size limits based on the computer resources available. Critically, RAM is a requirement for large networks. If you are merging many networks you may quickly create a VERY LARGE network which will create issues of its own. "Invalid License" - What should I do? This issue can be resolved by copying the original key attached to the delivery email back onto the target system. On some systems files can be set to be read only by default. If this happens, NodeXL Pro can then not update (and validate) its license key. To resolve the issue, find the location of the “.LIC” file we sent to you. This is the original license key file sent as an attachment to an email. Save this file to the location of the current license key file (you may have created a folder for this or left it in downloads or the desktop). When you locate the NodeXL Pro License key file (“licensePro_#.lic”) in the file browser, right-click it and select Properties. Then uncheck “Read-Only”. This should then allow NodeXL Pro to read and update the license key. If you cannot resolve this issue please send an email to info@smrfoundation.org and we will help you as soon as possible. "OutOfMemoryException" - What does that mean? If this message shows up, you have reached the limits of your machine. Please take a look at the sytem requirements above. "Object reference not set to an instance of an object" - What does that mean? A common cause for this issue is the location of the NodeXL Pro License key. Delete the current NodeXL Pro license key. Find the email that was sent with the initial NodeXL Pro license key attached. Copy the NodeXL Pro License Key to the local file system. A good place is a folder created on the desktop called “NodeXL Pro”. Restart NodeXL Pro. It will ask for the location of the NodeXL Pro License Key. Once that is provided, it should work properly. There are several other possible solutions to this problem. If these steps do not resolve the issue, please install TeamViewer and send a message with the Team Viewer ID and PW to info@smrfoundation.org and we will fix the problem as soon as possible. When installing NodeXL Pro I get "The value of the property 'type" cannot be parsed." - What does that mean? The "Document Actions" graph pane remains blank. How do I show the graph? How do I cite NodeXL in my research publication? What do all of the Overall Graph Metrics mean? A vertex is an element of a network. The vertices count is the number of people or things in the network. An edge is a connection between two vertices. The “unique” edges is the number of connections where multiple connections between A and B are counted only once. The “duplicate” edges count is the total number of multiple connections between two vertices. The “total” edges count is the total number of connections where multiple connections between A and B are all counted. An edge that starts and ends in the same vertex is a self loop. When two vertices both link to each other their connection is “reciprocated”. This is the percentage of vertices that have a reciprocal relationship. When an edge from A to B is joined by another edge from B to A then their connection is “reciprocated”. This is the percentage of edges that have a reciprocal relationship. A group of vertices that are all connected is a component. This is the number of separate sets of connected vertices. A vertex that has zero connections is “isolated” or an “island”. This is the count of vertices that have zero connections. A connected component is composed of a number of vertices. This is the count of vertices in the largest connected component. A connected component is composed of a number of edges. This is the count of total edges in the largest connected component. A geodesic is a chain or path composed of edges that link two vertices, potentially through intermediate vertices. A “shortest path” is the minimum number of connections needed to link two vertices. The “longest” “shortest path” is the “maximum geodesic distance”. The average length of these paths is the “average geodesic distance”. Density is the measure of the number edges among a group of vertices over the total possible number if everyone was connected to everyone. A high graph density means that most people are connected to many others. A low graph density means that most people are not connected to many others. Modularity is a measure of the fitness of the groups that are created in a clustered network. A group is a set of vertices. Many group cluster algorithms are intended to find sets of vertices that are strongly connected and relatively separate from other strongly connected groups. Modularity is the measure of the number of edges that leave a group to connect to vertices in a different group. If modularity is high, the clusters or groups created may be of low quality. If modularity is low, the groups are well defined. NodeXL updates frequently and the current version number is provided to enable troubleshooting and to ensure older datasets are properly understood. How large a network can NodeXL handle? How to deal with a VERY LARGE NETWORK? Network analysis can require large amounts of computing resources or require long periods of time to perform (or both!). Reducing the number of metrics calculated is one way to speed up analysis of a very large network. If you do not plan on using all the different types of “centrality” metrics, you may just want to skip creating them. To do this, modify the metrics selected in the NodeXL>Analysis>Graph Metrics dialog. In many cases network data sets can be reduced in useful ways that retain many important features and insights. In many networks it can be possible to count and then remove all “isolate” vertices (nodes with zero connections). All “singleton” or “pendant” vertices can also be counted and removed (these are vertices with just one connection to the network). All duplicated edges can be removed. Optionally, duplicate edges can be counted and removed and the count added to the remaining edge as a weight representing the number of removed edges. How are Self-Loops managed in NodeXL? In the Edges worksheet, each edge has a “Visibility” column (column G). In the “Visibility” column you can place a formula that checks if Vertex1 = Vertex2. If so, the formula places a “0” (Zero) in the cell. If not, the formula places a “1”. “0” (Zero) = “Skip” (which acts as if the data has been deleted). Then Refresh the graph and the self -loops should no longer be displayed!